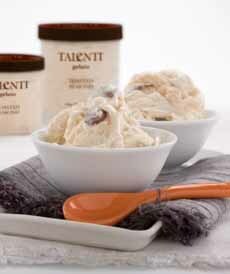 One of the many flavors of Talenti gelato, an American brand inspired by vactations in Italy (photo courtesy Talenti). This is Page 2 of a five-page glossary, featuring terms such as gelato, glace and granita. See our many other food glossaries. Gelato is Italian-style ice cream. It is made from water, milk and/or soy milk, combined with flavorings, sweeteners, and a stabilizing agent. Gelato comes from the Italian word for “frozen.” Traditionally, it has had two major points of differentiation from American ice cream: density and butterfat. Unlike ice cream, gelato machinery whips almost no air into the product (i.e., much less overrun), resulting in a dense and more intensely-flavored product. For example, American brand Ciao Bella Gelato contains 20% air by volume (overrun) compared to 60% in most American brands. Gelato is often described as having less fat because it’s made with milk and only a little cream, whereas ice cream generally contains more cream than milk. However, there are two chinks in the armor of this traditional description. First, U.S. ice cream industry professionals dispute this because there is no U.S. standard of identity for gelato—see the NOTE below. In addition, according to a report in Dairy Foods magazine,* as there is no longer one style of ice cream in America, there is no longer one style of gelato in Italy: the style of gelato varies significantly by region. The magazine reports that in the south, particularly in Sicily, gelato is made with milk and no egg yolks, and sometimes includes a thickener such as cornstarch—the “classic” style. 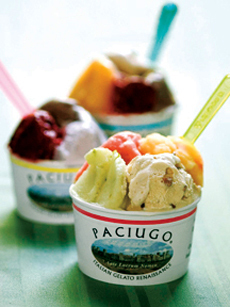 Authentic gelato is scooped from bins that are traditionally decorated with the key flavor ingredient. Below: Photo by Teoman Yuksel | Dreamstime. However in central Italy, for example, Tuscany, it is made from a milk and egg custard; in the north, it is very rich, as northern Italians use cream and eggs to make their gelato—a French custard style. But no matter what the recipe, all gelati have little or no overrun, the air that is whipped into traditional American ice creams to give it a lighter texture. 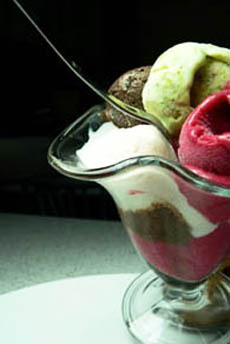 As a result, gelato is denser than traditional American ice cream, and this density produces a more heightened flavor. *“2004 Ice Cream Outlook,” by Donna Berry, Dairy Foods, March, 2004. Photo from Capogiro Gelato Artisans. To proceed with the “classic” description, Italian gelato typically has 4% to 8% butterfat, although Ciao Bella Gelato, a leading U.S., brand, has 12% butterfat. U.S. ice cream must have a minimum of 10% butterfat, and superpremium ice creams in the U.S. have a butterfat content of 15% to 18%. The greater amount of butterfat in ice cream tends to coat the tongue and the taste buds. The lower butterfat level of gelato allows more of the flavor of the fruits, nuts, chocolate et al to shine through. 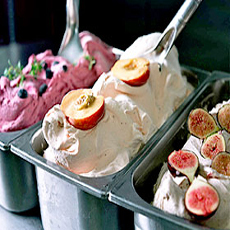 In addition, gelato recipes tend to have a higher proportion of flavoring than ice cream. The end result is heightened flavor. The bright plastic spoons and paper cups are a signature of Italian gelaterias. Photo courtesy Paciugo Gelato. On a related note, we have observed anecdotally that some of the finest artisan gelato is not dense—the texture is ethereal. When we asked Jon Snyder of Il Laboratorio del Gelato in New York City why his gelato was not “textbook dense,” he replied that typically, gelato in italy is more dense for two reasons. The Italian machines tend to churn the product at a slower speed, thereby lessening the air intake. Also, Italians traditionally use recipes, with more milk and less cream, that take on less air and are more dense (milk doesn’t whip up like cream does). Glace (pronounced glahss) is the French word for ice and ice cream. Granita, meaning granular in Italian (granité/granitée is the French word, meaning granite-like), is a frozen dessert made without an ice cream machine. Instead, a sugar-syrup base, flavored with fruit purée, coffee, herbs and/or wine, is frozen in a pan. As the crystals on the top of the pan freeze, they are scraped into a grainy, coarse sorbet. Commercial granitas are frozen in a gelato machine, which produces finer ice crystals. 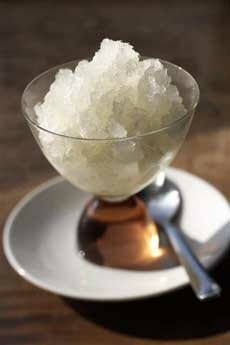 Lemon-ginger granita. Photo courtesy Spice Islands. 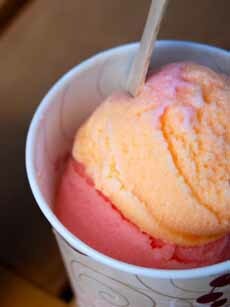 Guri guri is a sherbet-ice cream hybrid created on Maui, Hawaii. The result is light, fruity and creamy. The secret recipe, in two flavors, is believed to be a blend of strawberry or pineapple juice, lemon-lime soda, and sweetened condensed milk. As the story goes, in Japan in the early 20th century, Jokichi Tasaka invented an ice cream–sherbet hybrid so good that he called it “goodie goodie.” After emigrating to Maui, he opened a confectionary store and sold the frozen treat. Fellow immigrants mispronounced the original name as guri guri. If you find yourself in Maui, head to Tasaka Guri Guri in the Maui Mall. It is run by Jokichi’s granddaughters. Strawberry and pineapple guri guri (photo courtesy Tasaka Guri Guri). See shaved ice and snow ice. 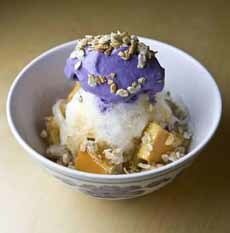 Halo halo is a Filipino shaved ice sundae. The bottom scoop is made from shaved (not crushed!) ice and evaporated milk; the top layer is ube (purple sweet potato) ice cream. Toppings can include coconut gel and coconut string, jackfruit or other fruit(s), sweet red beans (azuki), sweet white beans, and other options. In fact, flavors and toppings vary widely from shop to shop. Long before it was a song and dance* beloved of children, the hokey pokey, as it relates to food, can be traced to Italian street vendors who sold inexpensive ice cream treats in the late 19th and early 20th centuries. “Hokey pokey” is the English adaptation of the Italian phrase, “o che poco,” meaning how oh, how little—meaning inexpensive. One type of hokey pokey was a slice cut from a brick of ice cream. According to Jeri Quinzio, in her book Of Sugar and Snow: A History of Ice Cream Making, “These bricks were generally about eighteen inches long, twelve inches wide, and two and a half to three inches deep. The flavors were arranged lengthwise in a mold with tin dividers, which were removed once the ice cream was packed into the mold. 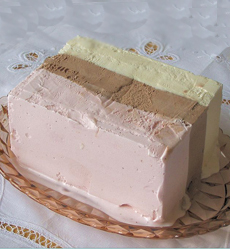 A quart of Neapolitan ice cream is a much larger version of the “hokey pokey” slice of yore. Photo by P. Schemp | Wikimedia. “They were usually layered with three different flavors of ice cream, and each crosswise slice would reveal all three....they cost one or two pennies, and...children would buy half a slice for half the price...The wrapped slices were sold to ice cream vendors. Whole bricks were sold to ice cream shops to be sliced and served, and also to householders, who had to rush home to serve them to their families before the ice cream melted.” The three flavors were typically chocolate, strawberry and vanilla. This combination of flavors became known as Neapolitan ice cream. As late as the 1960s, one could purchase a box of individually wrapped slices in the supermarket that closely resembled what the “hokey pokey man” sold many decades earlier from his cart. *The song was originally written for adults. According to one account, reported in Wikipedia, in 1940, during the Blitz in London, a Canadian officer suggested to Al Tabor, a British bandleader of the 1920s through 1940s, that he write a party song with actions similar to “Under the Spreading Chestnut Tree.” The result, “The Hokey Pokey,” was inspired by an ice cream vendor whom Tabor had heard as a boy, calling out, “Hokey pokey penny a lump. Have a lick make you jump.” He changed the name to “The Hokey Cokey” at the suggestion of the officer, who said that in Canada, “cokey” meant “crazy” and would sound better. In the U.S., the song has always been called the Hokey Pokey.